Do you have a guide for sanitzers for above ground pools? You have so may Salt Chlorine Generators which one do you recommend? Where do I install my Salt Chlorine Generator? How much salt will I need to add to my swimming pool? How do I Add Salt to my pool? How do I clean my Salt Generator's Turbo Cell? How do I clean my Zodiac Clearwater Cell? What is the difference between the AquaRite & AquaRite Pro? What are the Sense and Dispense Add on Modules? Why is CO2 better than acid to maintain pH? After it's installed, will pool maintenance change? Do I still need to use chlorine? Why? How do I dispose of used cartridges? How does copper-silver ionization work? How do copper and silver ions sanitize water? How do you control the actual amount of ionization taking place? How do you know if ionization is taking place? What is the recommended copper ion level? How can I tell if the unit is functioning? Do I need to test for the silver ion level? Is it difficult to change the electrodes? How do I know if my electrodes need cleaning or replacing? How hard is it to install the system? Will I ever have to shock my pool again? Why do I need to oxidize? How often will I have to oxidize? Can Ionizers work with other systems? Do I have to maintain a free chlorine residual in a residential pool or spa? Let us help choose the right one for you. A: Ozone is a natural purifier created in nature by the combination of oxygen in air and the ultraviolet rays of the sun or by the corona discharge during a lightning storm. Ozone has a clean, fresh scent noticed after a rainstorm. Ozone is the alternative water purifier to traditional chemicals such as chlorine and bromine. Q: What does Ozone do? A: The Ozone layer in the atmosphere protects the earth from deadly radiation. Ozone destroys bacteria, viruses, mold, and mildew and eliminates spores, cysts, yeast, and fungus. While eliminating oils and other contaminants in water. Ozone keeps water clean and sparkling clear and keeps. Q: Will ozone hurt me? A: No! In the quantities necessary to be effective, ozone is very gentle to humans and equipment in the water. However, you should never breathe concentrated ozone gas. Q: Will ozone kill bacteria? A: Yes. It is one of the most effective, complete bactericides of all earth's measurable elements. Q: Can the ozone in my pool irritate skin or eyes like chlorine in pools? A: No! Ozone is very gentle to skin and eyes. Q: You have so may Salt Chlorine Generators which one do you recommend? A: First let's start by talking about how a salt chlorine generator works. A salt chlorine generator is a two part system the cell which is the portion which actually manufactures chlorine for your pool and the Power supply which is the portion of the unit where you control the salt chlorine generator. The cell is plumbed inline with the rest of your pool equipment and is typically the last piece of equipment on the return side. 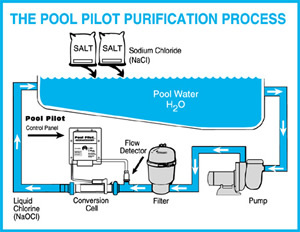 With a Salt Chlorine generator you add salt to your swimming pool, this amount of salt is below the taste threshold so you do not taste salt in the pool, most of the units we sell operate on 3,000 parts per million of salt (PPM) where ocean water is approximately 50,000 PPM of salt. A standard size pool will require about 500 Lbs. of salt at start up, you use a granular salt which typically costs about $10 per 50 Lb. bag at your local hardware store. The salt does not dissolve out of the pool water so the only time you would need to add salt after the initial start up would be if you had a party where water was splashed out of the pool or you had a heavy rain shower which may dilute the concentration of salt, if this were to occur you would just need to add a couple of cups of salt to the pool to get up to the 3,000 PPM of salt. As the diluted salt water passes through your pump and filter system the last piece of equipment the water passes through before going back to the swimming pool is the Salt Cell. The salt cell has an electrical charge, the reaction between this electrical charge and the diluted salt water results in chlorine which is sent back to your pool, so you are actually manufacturing chlorine for your pool. So now that we have the basics on Salt Chlorine generators which one should you choose. In our experience we have had the best luck with the AutoPilot Salt Chlorine generators. Within the salt cell are seven blades which are lined up vertically, each one of these blades has protective coating on them, over time the coating on these blades wear down and when the coating completely wears off is when you will need to replace your salt Cell ($250 - $350). The AutoPilot brand has about 40% more coating per blade than the competition because of this we tend to see that the AutoPilot cells last longer, typically 2-3 years longer. The AutoPilot units also have what is called a By-Pass Manifold this means that only about 20% of the water from your pump actually passes through the salt cell, the lower flow going through the cell actually creates a better quality of chlorine and less wear in tear on the cell, once again helping to prolong the life of the cell. The AutoPilot has the ability to Super Chlorinate your pool which would act as Shocking the pool. The AutoPilot is available in two models The SoftTouch and the Digital, the only difference between these two models is the power Supply the SoftTouch has diagnostic indicator lights on the Power supply where the Digital has Full Digital Readout on the Power Supply, both units use the exact same cell so the production of chlorine on the SoftTouch or Digital is the same only the Power supply is different. Q: How does a Salt Chlorine Generator work? A: The AquaRite electronic chlorinator generates chlorine by passing low voltage electrical current through the pool water and converting the chloride ions from salt into chlorine. AquaRite Salt Generators provide 100% of chlorine requirement. Most pools require less than $10 of salt per year. Q: Where do I install my Salt Chlorine Generator? A: The Salt Chlorine Generator is easily installed into your existing system. It goes into your exit line after your pump filter and heater. The Salt is dumped directly into your swimming pool and is converted once it runs throught the Salt Chlorinator Conversion Cell. Q: How much salt will I need to add to my swimming pool? A: The addition of salt to your pool will vary depending on the type of chlorinator you purchase, the size of your swimming pool, and the concentrate of salt already in your swimming pool. To get a good estimate on how much you will need we used the Aquapure Salt Generator with a few different sizes of pools. Q: How do I Add Salt to my pool? A: Most people simply dump the salt into the shallow end of the pool and then brush it around to speed up the dissolving process. Do not allow the salt to sit in a pile at the bottom of the pool. Salt water is heavier than fresh water so the salt water will tend to accumulate at the deepest part of the pool. Run the filter system with the suction coming from the main drain for 24 hours to evenly distribute the salt throughout the pool. Q: How do I clean my Salt Generator's Turbo Cell? A: 1) Turn Filter pump off 2) Remove the AquaRite TurboCell by loosening the unions on both ends of the cell 3)You will need a small plastic bucket (6 - 8" opening), water and muriatic acid 4)Fill the bucket with 3 - 4" of water 5)Set the TurboCell, on end, in the bucket of water 6)Add 1 - 1 1/2" of muriatic acid to the water in the bucket. Let the cell sit in this solution for 5-10 minutes 7) Turn the cell over and let the other end sit in the solution for 5 - 10 minutes. You will be submersing the cord, which will not be affected by the mild acid solution. 8)Look in both ends of the cell to confirm calcium deposits are removed. If not, repeat cleaning procedure 9) Rinse cell with fresh water and replace in plumbing line 10) Hand tighten unions before restoring power to filter pump. IMPORTANT: Dispose of water and acid mixture in a safe manner by pouring the contents of the bucket in your pool. Q: How do I clean my Zodiac Clearwater Cell? A: In unusual situations, the self cleaning electrodes may benefit from occasional manual cleaning to remove scale build-up as the result of having very “hard” water or continuous high pH conditions, which can occur with new plaster finishes. Switch off the filter pump and chlorinator, close necessary valves. Note:Always turn pump off prior to installing or removing any Clearwater Cell. Your pump/filter system is operated under pressure and pressure must be released before you begin. Open the air relief valve on your pool filter to release the pressure in the system. Undo the two barrel unions joining the cell housing to the pool filtration system and carefully remove the cell housing. Lay the housing upside down on a flat surface with the inlet ports on top. Mix cleaning solution in a suitable plastic vessel by adding one (1) part of Hydrochloric (muriatic) acid to ten (10) parts water. Note:To avoid splash, always ADD MURIATIC ACID TO WATER rather than water to muriatic acid. Solutions stronger than 1:10 will damage cell and void warranty. Pour the cleaning mixture into the upturned cell housing until the electrodes are completely covered. Allow the cleaning solution to dissolve the calcium deposits for approximately 5 minutes.When the electrodes are clean, pour the cleaning solution and the calcium residue out of the cell housing into a bucket of water. This can now be disposed of down a drain. Note: Never mix chemicals together.Always rinse bucket and drain area after cleaning cell. choosing a location to open and use chemicals as they may damage any surface in which they come in contact. Repeat the procedure if necessary.Take care to avoid splashing the cell terminals and other equipment with the acidic cleaning solution.Wash down any spills with plenty of fresh water. Rinse the electrodes in clean water and refit the cell and housing to the filtration system. Tighten the barrel union connections to prevent leaks. Replace the electrical connectors after drying and smearing lightly with silicone grease. Reset valves and switches.Turn pump and chlorinator on. stops.To prevent cell damage and personal injury, do not in any way interfere with this system that has been designed for your protection. remain cool in hot weather. Sometimes small insects may enter the case of the power pack, and this can cause damage to the internal electrical components.To avoid this, spray some insect repellent on surfaces around the powerpack. Q: What is the difference between the AquaRite & AquaRite Pro? A: The AquaRite Pro has the ability to add the Sense and Dispense Add on Modules. Q: What are the Sense and Dispense Add on Modules? Q: Why is CO2 better than acid to maintain pH? A: The reason we suggest maintaining your pH levels with CO2 instead of acid is because of the safety factor. First you don't have to store hazardous acid in a tank on your property. Secondly CO2 can only bring your acid level down 5.5 which is far below where you would need to have your pH, however acid can bring your pH levels all the way down to 0 which would be dangerous as well as harmful to your pool and equipment. A: Nature2 is an alternative sanitizer water purification technology for swimming pools and spas that gives the purest, clearest water imaginable. Q: How does Nature2 work? A: Nature2 products use the same minerals found in nature to trap bacteria and algae. Because Nature2 traps bacteria and algae, less harsh chemicals are needed to keep your pool or spa water balanced. By using Nature2, you reduce the level of harsh chemicals between 50% and 80% versus the harsh chemical levels you would need without Nature2. A: Nature2 guarantees all this. Less chlorine, less chemical use, fewer chemical hassles. No red, burning eyes, irritated skin or discolored hair.Less time necessary for pool maintenance. Nature2 will never create pool stains. Easy to use. Annual cost equal to or less than your current treatment. A more refreshing, highly enjoyable swimming experience. Q: How do I know if Nature2 is working? A: The best test is improved water quality. You'll notice a big difference. Visual clarity and sparkle, even at low oxidizer levels show Nature2 is working properly. Q: After it's installed, will pool maintenance change? A: Yes, you will dramatically reduce chemicals use and maintenance time. Basket cleaning, vacuuming and water testing will be the same as before, but the water balance will be easier, meaning there's simply less to do. Q: Do I still need to use chlorine? Why? A: Yes, although nature2 is an alternative sanitizer you still need to use a small amount of residual oxidizer. With Nature2 you can reduce this amount by 50% to 80%. For superior results, we recommend low levels of free chlorine (0.5 ppm free chlorine minimum). You won't feel, smell or be affected by chlorine at this level. Q: Is Nature2 a filter? A: No. A filter removes particles and debris, while Nature2 purifies pool water by trapping bacteria and algae, which are too small to be caught by a filter. You still need a filter when using a Nature2 system. A: Nothing - including filter run time, heavy use, hot weather, and water temperature. A: The minerals inside Nature2 are natural, so it is safe for disposal with other household trash. Q: Can Nature2 stain my pool? A: No. Nature2 minerals remain well below levels that might cause staining. In fact, Nature2 offers a "no-stain" warranty. A: Because of the efficiency of Nature2, super-oxidation is needed much less often. You only need to super-oxidize if the pool becomes dull or cloudy. The start-up of each new cartridge requires an initial shock with chlorine. A: An ion is an atom, or group of atoms that possess an electrical charge. An atom is like a tiny solar system, with a nucleus in the middle and one or more electrons orbiting around the outside. Inside the nucleus are positively charged particles called protons. The electrons are negatively charged. An atom usually contains an equal number of protons and electrons. An ion gets its electrical charge by losing or gaining electrons. If it has an extra electron, it is called an anion. If it has lost an electron, it is a positive ion, or known as a cation. Copper silver ion systems produce cations. Q: What is copper-silver ionization? A: The process that causes an element to gain or lose electrons is called ionization. Copper-silver ionization is the electronic release of copper and silver ions. Q: How does copper-silver ionization work? A: A set of electrodes, made up of an anode and cathode are placed in a flow cell. This flow cell is placed in-line with the circulation system. A controller provides a low voltage, alternating DC current. This is passed between the anode and cathode. The voltage causes some of the outermost atoms of the anode to lose an electron, thus becoming positive ions, which attempt to flow across to the cathode. In this process, the ions are carried away by the flow of water. Q: How do copper and silver ions sanitize water? Q: How do you control the actual amount of ionization taking place? A: The electrodes are connected to a control panel which governs the system. By advancing the output time on the controller, you increase the amount of ions dispensed into the water. Buy reducing the output time, you reduce the number of ions dispensed. Q: How do you know if ionization is taking place? A: Every Thomsontec ion system includes a test kit that can measure a precise amount of copper ions in the water. A single test should be done a minimum of once a week in the hot summer months. The test only takes a couple of minutes. You compare the color of the tested water to a chart on the test kit to determine the copper ion level. Q: What is the recommended copper ion level? A: The recommended range is between .20 and .50 ppm. If the reading is low, simply adjust the controller to a higher setting; if the reading is too high, turn the system down. Q: How can I tell if the unit is functioning? A: The controller features a digital readout of the duty cycle and an anode indicator. The anode indicator will be lit when current is passing between anode and cathode. The copper test kit tells the actual copper level. Q: Do I need to test for the silver ion level? A: Whenever the copper ion level is correct, the silver ion level will be in range also. The electrodes are a mix of copper and silver, so the right proportions are always being released at the same time. .Q: Is it difficult to change the electrodes? A: On the some models such as the 150MPC,, the electrodes come premounted in a PVC cap. Simply unscrew this cap from the flow cell and replace with a new one. Wrap some teflon tape around the threads before installing. On other models such as the 450MPC, no tools are required as the electrodes are held in place by a quick release sanitary clamp system. Q: How do I know if my electrodes need cleaning or replacing? A: The anode light will not be lit if there is a problem with the electrodes. Also, running the system at higher levels and not being able to generate any sort of copper reading on the test kit will also be an indication. .Q: How hard is it to install the system? A: The installation is not difficult in most cases. An installation manual is included with each system. .Q: Will I ever have to shock my pool again? A: Yes. As ion systems have no oxidizing potential, it will be required. There are a number of alternatives. If you prefer to use a non chlorine shock, one pound of potassium monopersulfate per 10,000 gallons should be applied once a week in swimming season. This non-chlorine shock dissolves instantly and you can swim immediately after adding it to the pool. You can also use a non stabilized chlorine. The amount will vary depending on the manufacturer. Be sure to follow all directions from both the ion manual and your pool professional. Q: Why do I need to oxidize my pool? A: Oxidizing helps maintain clear, sparkling water. There are a number of contaminants that will be in the water that are not algae or bacteria. These can cause cloudy water, for example, body oils, suntan lotions, and other types of organic matter can be present. The easiest and best way to get rid of these contaminants is by oxidizing. Also, oxidizing helps dissolve the bio-shield that can build up around algae cells preventing the ions from getting to the algae and killing it. Q: How often will I have to oxidize? A: It all depends on your swimming pool and the environment. Maintaining good water balance and keeping regular maintenance habits will help. Generally we recommend that you oxidize a minimum of once a week. In cooler weather, or in dry areas, once a month may be sufficient. Commercial pool owners are required to keep an appropriate free chlorine residual in the pool at all times. This varies from district to district. Commercial swimming pool operators should consult with their local health authority to insure they are within regulations. Q: Can Ionizers work with other systems? A: Yes, ion systems work well with ozone, bromine, chlorine and other methods of sanitation. Consult your local pool professional for more information on your particular application. Q: Do I have to maintain a free chlorine residual in a residential pool or spa? A: In residential pools, there is no legal requirement to use chlorine at all. In fact, many ion users don't. They use a non chlorine shock or ozone and are very happy. However, we are not suggesting or recommending the ion system is an alternative to chlorine alone. Lab tests have been done and reports written that state that a low level of chlorine and the use of an ion system is a much better way to sanitize than either method alone. We are in favor of any method or combination of methods that will insure safe, sanitary water and at the same time provide exceptional water quality with virtually none of the down sides associated with standard sanitizing chemicals. In this combination the chlorine level is very low (<.5ppm) so it is basically unnoticeable plus the ion system is much more effective because of the presence of this low level of halogen providing constant oxidization. This provides the best of both worlds.